Sebelius may be confirmed as early as today! Call your senators NOW! The Senate Finance Committee earlier today narrowly voted to confirm Kansas Gov. Kathleen Sebelius to Secretary of Health and Human Services by a vote of 11-8. The vote reflects the growing opposition to Sebelius in light of new revelations about her deep financial ties to the abortion industry and notorious abortionist George Tiller in particular. There is growing momentum against this nomination among Senate members and we need YOU to light up the Senate switchboards. We can stop this by acting NOW! Please call your senators at 202-224-312. Urge them to oppose this radical nomination. Kathleen Sebelius is a threat to our nation’s healthcare. Gov. Sebelius lied to the Senate Finance Committee when she testified she received $12,450 over an eight-year period from infamous late-term abortionist, George Tiller. In reality, Gov. 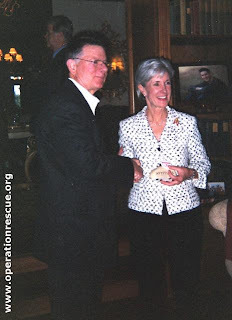 Sebelius received over $35,000 in personal and PAC contributions from Tiller and another $200,000 he donated to ProKanDo, a political action committee dedicated to defeating Sebelius’ pro-life gubernatorial opponent. Kathleen Sebelius is radically wedded to the pro-abortion industry. She must be stopped and we need YOU TO STOP HER! CALL NOW! Please contact Sebelius' home state senators - Sen. Brownback's and Sen. Roberts' offices. Ask them to stand up against this nomination and stop Sebelius by invoking senatorial courtesy!